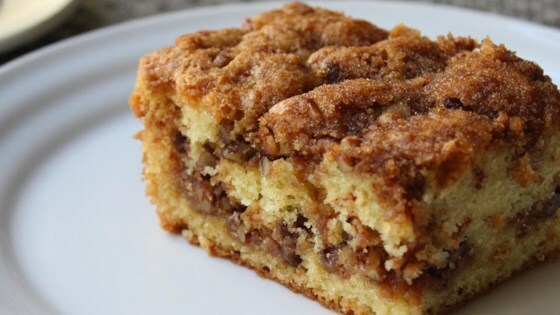 "For me, the best part about coffee cake is the crispy, crunchy, buttery crumbs. So here I significantly upped the amounts used. Bake times will vary according to pan size and composition." Preheat oven to 350 degrees F (175 degrees C). Butter an 8-inch by 10-inch baking dish. Mix pecans, 1/3 cup white sugar, brown sugar, cinnamon, salt, and melted butter thoroughly in a mixing bowl until all components are coated with butter, 3 to 4 minutes. In a separate bowl, whisk together flour, salt, baking powder, and baking soda. In another bowl, mix together butter and 1 cup sugar with a spatula until well blended. Add 1 egg and whisk until mixture is smooth, 2 to 3 minutes. Whisk in second egg until thoroughly incorporated. Add vanilla and sour cream; whisk together. Add flour mixture to wet ingredients; whisk until flour disappears (do not over mix). Spread one half of the batter evenly into the bottom of the prepared baking dish. Scatter one half of the crumb mixture evenly over the top of the batter. Top with the rest of the batter and spread carefully to evenly distribute, trying not to disturb the crumbs. Top with the rest of the crumb mixture. Very gently press crumbs into batter. Bake in preheated oven until a bamboo skewer comes out clean, 30 to 35 minutes. Let cool slightly before serving. When measuring flour, it's best to gently spoon the flour into your measuring cup. If you dip the cup into the flour it packs the flour and you'll end up with more flour than is called for. Meh. I know I'm in the minority but this was not the style of coffee cake I was looking for. It was too eggy for me and not that light and fluffy coffee cake like you get at the bakery. One of the best coffee cakes I have ever made. The trick is in how the ingredients are mixed together.